Norma Jean is beginning to lead train our 12 week old puppies. She told me last night that each of the pups takes to the lead a bit differently. Some are passive. Some go nuts. I’m wondering if any of you have pointers to offer about this crucial step in the training process. Maybe some have stories to share, too. As I recall, whenever I’ve been in charge of this early training, I’ve noticed that the “show” dogs seem to find their stride (gait) right away, generally as soon as they get finished acting like a hooked steelhead. LOL Has that been the case with your pups? That is, have your show dogs, performance pups, too, I suppose, rather naturally became show offs on the lead? 1. Lead train them by the time they are 7 weeks old. 2. Pick the puppy up and take it two or three houses, (if you live in the city), from home. Put the puppy down and lead it back home. 3. Put the puppy on a lead and let it follow Mama, who is being led ahead. 4. Put the lead under the puppy’s chin so that if it pulls back, the head is lifted rather than being pushed down by the lead over the top of the head. This also allows the pup to be encouraged to come forward with a treat. I found by putting little harnesses on each puppy, (about 7 weeks of age), it works amazingly well. A lead is clipped to the back of the harness and they go right along with no resistance. Then later, (10-12 weeks), I introduce the lead around the neck, and amazingly they do not resist. It is also important to talk to the pups in kind of a high pitched happy manner, like “come along,” “good girl/boy,” so the praise is paired with the walking on the harness and then paired to the lead around the neck. One word of advise though, do not leave the harnesses on the pups, as they will chew them off each other when unsupervised. BTW, I found the harnesses in a variety of colors at Walmart here in So. Cal for a reasonable price. A product that worked wonderfully for both my pups was Gentle Leader. It provides better control of the pup while on the leash, allowing you to concentrate on training and gait, rather than how to get the little wild ones to stop pulling and bucking. Speaking of the Gentle Leader, Premier has come out with a new product called the Easy Walk Harness. Same principle as the Gentler Leader, but the dog doesn’t have to spend time getting used to having something on its head. My mom tried it out the other night with my two Kerries and said it was like walking two different dogs! Any questions, feel free to email me privately. You know, it is funny with these larger terriers. When I was lead training my Welsh Terrier or Miniature Schnauzer puppies, there was without exception that lead action very reminiscent of landing a salmon or flying an old style model airplane. With all 3 of my Kerries and our Irish Terrier, I just put a collar and lead on them and off we went. Rocket was especially easy. He just knew. He was like that on the grooming table too. I do not start beginning lead training with show leads or slip leads. I do start with a buckle collar and a 6′ leather lead. Generally I like to walk puppies with older, trained dogs. I use a clicker and treats to shape desired behavior. Depending on whether or not the dog will be in the show ring, I try to get to handling class. I also get our young dogs to trials (agility), just so they can be socialized and exposed to the sounds, sights, and activities of a busy show ground. Whether or not a puppy will ever compete in show or agility or not, I like to train them as if they will. Focusing on me, my hands, and my body positioning will go a long way in forming a showy and consistent team presence. 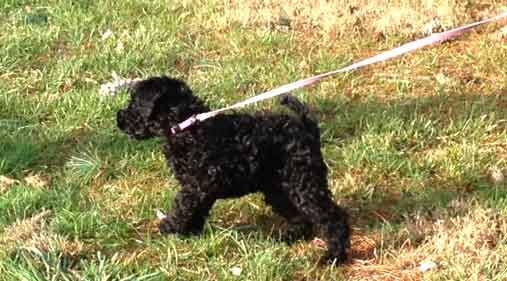 I start training by trailing a lead on a puppy while indoors, or in the garden. Pick up the lead every so often and call the pup towards you. They soon get used to the feel of the lead in preparation for the Great Outdoors. ALWAYS supervise while training in this way. Why not walk them with their mom. . .One at a time? They see it doesn’t bother her, so it can’t be too bad.